Smoke can fill your home, leaving behind a stubborn residue on every surface it touches. Your property and valuables will be damaged, and your entire home or business will become unusable due to the overwhelming smoke smell. Fortunately, Skyline DKI’s smoke damage restoration experts will be able to give your property the thorough cleaning it needs! Property owners throughout Chicago, Milwaukee, and surrounding areas can trust the experts at Skyline DKI to completely restore their property. Our cleaning crew will use the best and most sophisticated equipment to clean your valuables and the structure of your property and to completely deodorize your property. Skyline DKI is here for you! Strong smoke odors can be dangerous to the health of anyone spending time on the property. Don’t try to live with the damage call Skyline DKI for 24/7 emergency smoke removal services in the greater Chicago and Milwaukee area’s. We’ll clean your property and completely eliminate the odors, so your home is safe once more. Call Skyline the minute you discover damage to your property! Q: Will the smoke odors go away on their own? Not necessarily. The smoke odors will only go away if the smoke residue has been removed and effective steps have been taken to neutralize the smell. In other words, that overwhelming smell may linger for a long time if you don’t take steps to get rid of it as quickly as possible. Q: Can I clean up the smoke damage on my own? It may be all right to clean it up on your own, you’ll want to talk to smoke damage cleanup professionals first. Give us a call, and our trained team members will assess the situation. If the smoke damage is limited and confined to a small portion of your home, it may be all right to clean up on your own. Q: Will you be able to get rid of the soot residue and the discoloration on my walls? Yes. Our complete property restoration crew will be able to completely eliminate the residues, and they will make sure the structure of your property is returned to its pre-smoke damage condition. 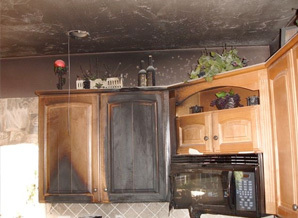 No matter how extensive the damage, our team will make your home like it was before the fire!